Is a subversive copy editor right for you? 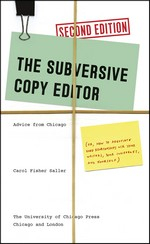 The Subversive Copy Editor, a 2016 book by Carol Fisher Saller, highlights the skills editors need for good working relationships with writers. Carol is the editor of The Chicago Manual of Style Online’s monthly Chicago Style Q&A, and has handled tens of thousands of writing and editing queries since 1997. Her editing approach is ‘subversive’, firstly because it puts the reader above the writer as the ultimate boss of editors, and secondly because ‘to live a good life as a copy editor, a person must occasionally think outside the rules’. Of course, this is not really subversive. Experienced editors know when a style is just a style, and when to break rules. Carol emphasises the need for editors to keep reading and keep up to date with language trends so they can ‘acquire the power of knowing when to break a rule in order to help writers achieve great writing’. a work will never be edited the same way twice and it will never be considered perfect, no matter how many times it is edited. So, yes, a subversive copy editor is probably right for you. Note: I received a review copy of this book from University of Chicago Press through Editors NSW. This entry was posted in Editing on 31 July 2016 by Rhonda Daniels.